I mentioned when making the railings up last week that a few snips would easily make some broken railings. So I did just that. The figure is a Frostgrave cutlets 80% done that should appear shortly. 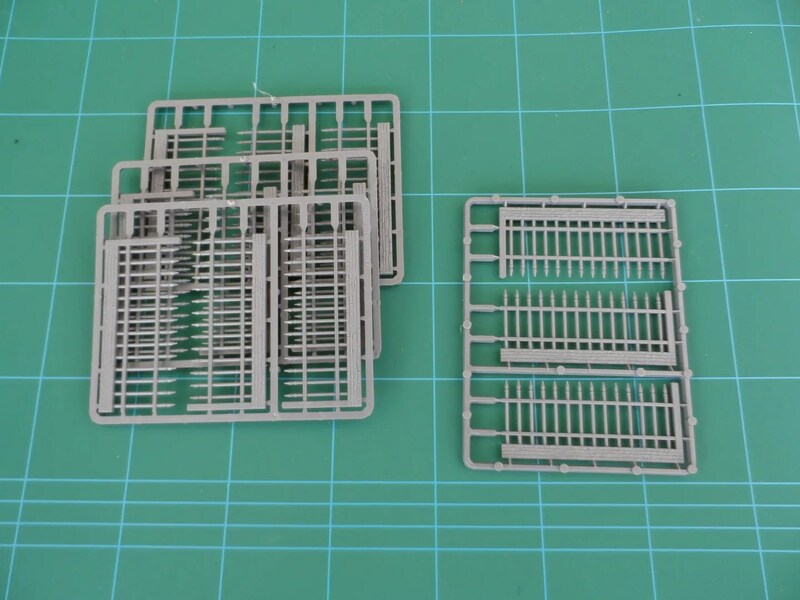 These should make nice linear pieces of cover that don’t impede movement too much. 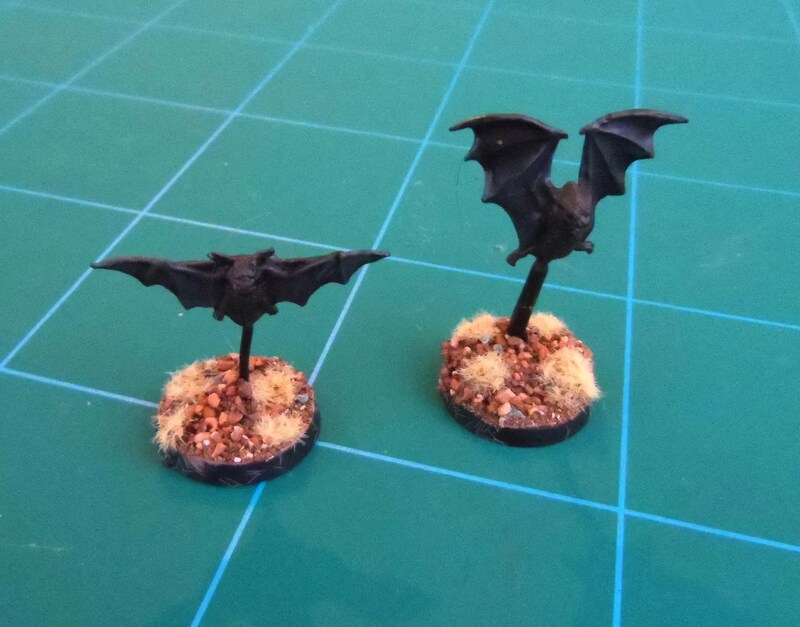 Two giant bats, one metal from the old Vampire Counts range and the other a plastic Heroquest one. Painted with Foundry Charcoal Grey and Bay Brown, and then washed black so you have to look carefully to see they aren’t just black blobs ! I went with the dried grass again as I seem to be doing for a lot of my nasty undead creatures. Talking of which there should be some more of them in the next couple of days. So, Holbron was on his own facing the EVIL one – Thaddeus. 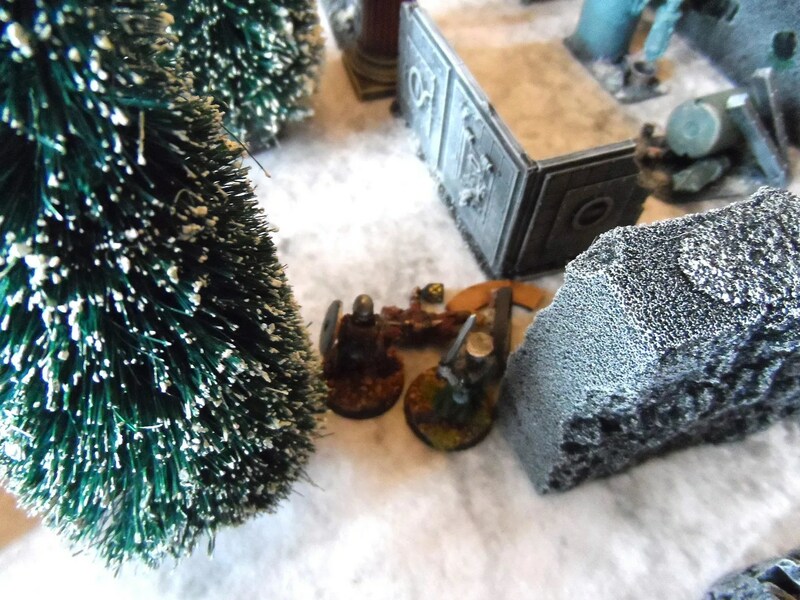 Well he knew he had to get out of there, but couldn’t resist the chance to injure his long time foe, so he picked up a snow ball, muttered some words, and casually tossed it at the feet of his foe before planning a get away back through the gate. 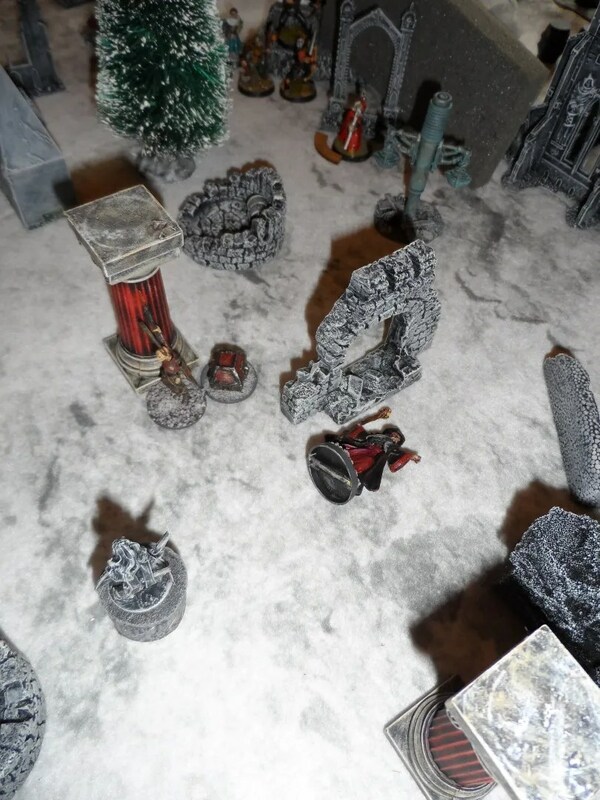 …the smoking ruins of Thaddeus were seen lying on the floor ! 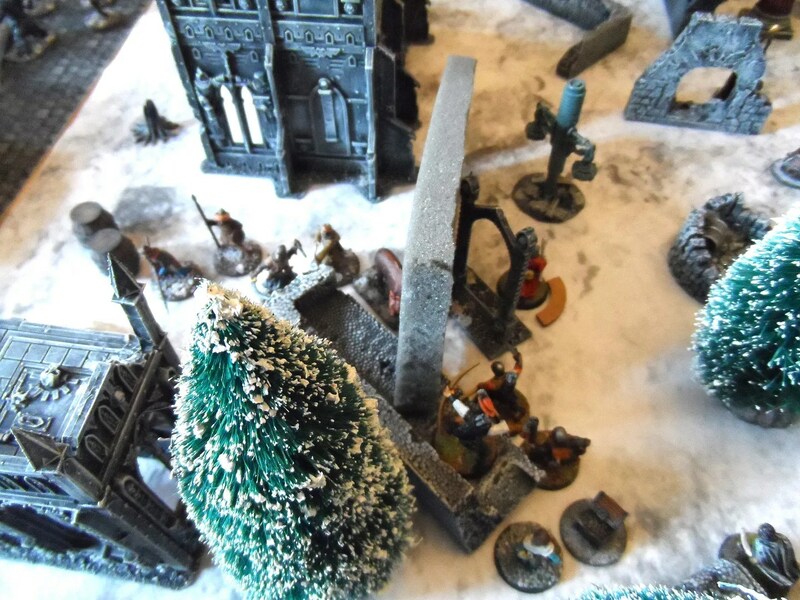 This is only the second game where a Wizard has been put out of action. 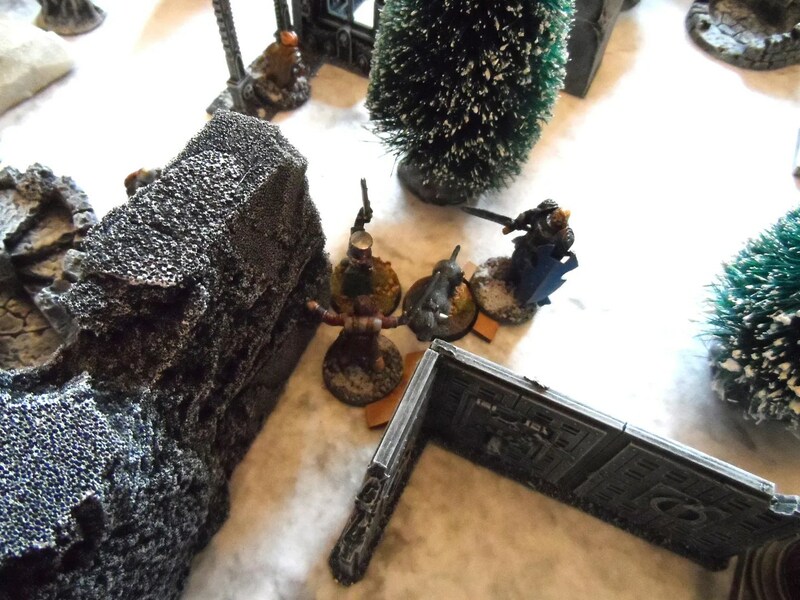 Holbron decided he’d better not push his luck, went back through the gate…and ended up outside the secret room looking in, as did one of Thaddeus’ minions (an invisible thief). 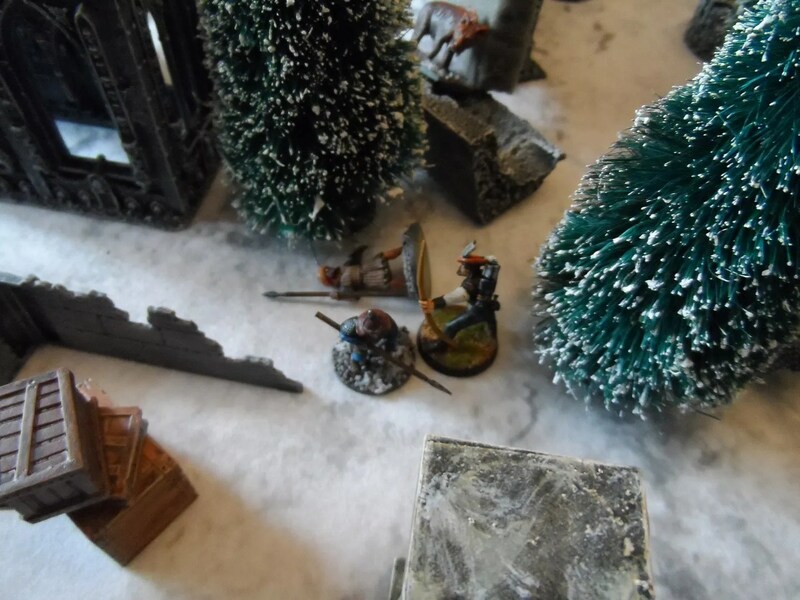 Their wizard down, my Rangers mobbed an archer, and put him down as well. Followed by my Captain (now nearly painted with his shield (! 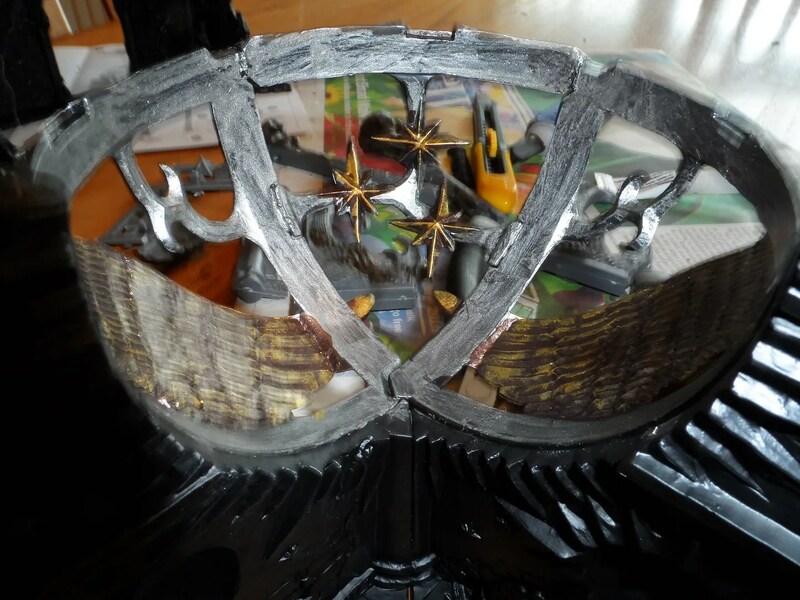 ), to put the Blue Knight out of action on the other side of the table. And then the Knight (also now nearly painted) dispatched the enemy Treasure Hunter. 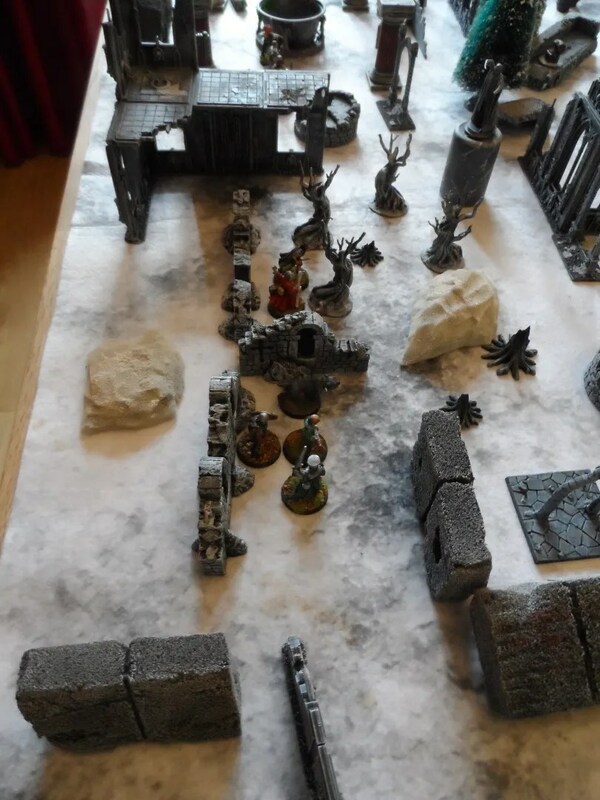 Unfortunately, at that point 4 Cultists and a Zombie Troll turned up and headed toward the gate, two Cultists made it and headed off to the secret room via magic. So my now scattered war band started heading for safety. One Ranger down, one Ranger outnumbered. But rolling a 20 helps ! 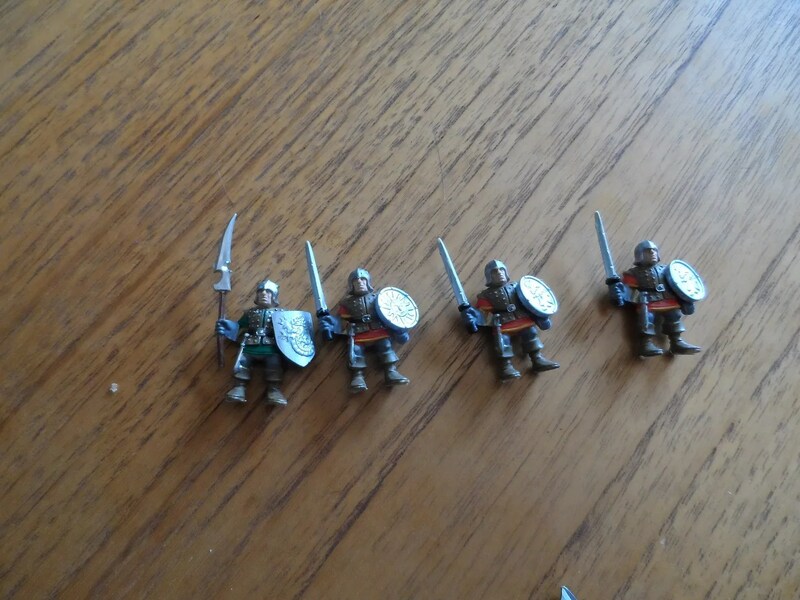 Thaddeus’ warband had by now lost four members. The summoned skeleton carrying the loot, had also been shot down by my archer. My second Archer collected a third treasure chest, and accompanied by my Captain started to head off the board, only for the snivelling Apprentice to Thaddeus summoning an Imp their way. At this point however, Jon threw in the towel – he had to go take his wife to work. 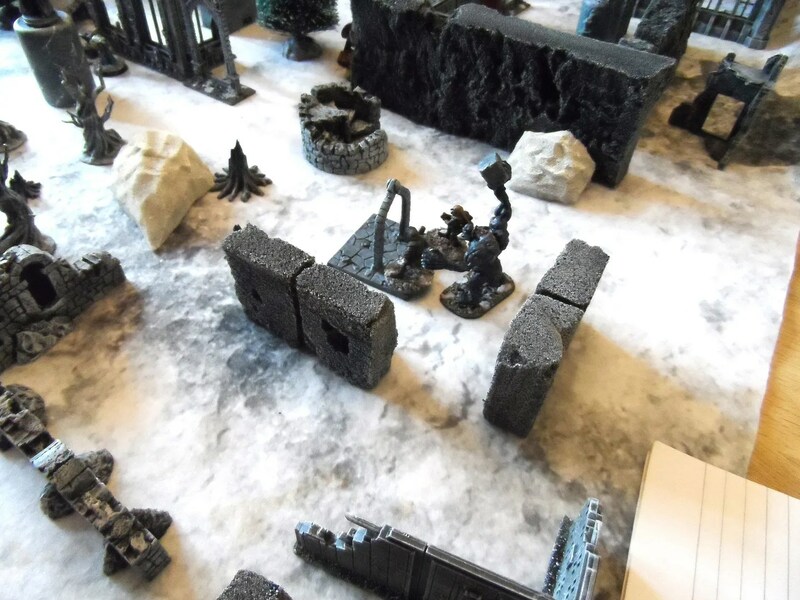 However, in game terms I’d destroyed nearly half his war band, his barbarian had long since left the table with a single piece of treasure, and there was no way of getting at the remaining loot in the secret room with what forces he had left. 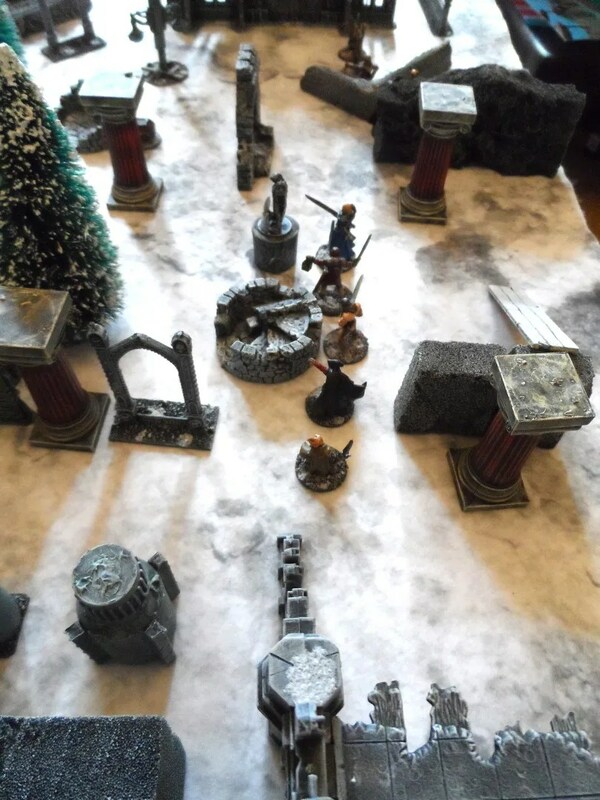 I came away with three treasure chests, and had downed the enemy wizard (XP !!!!!). My only two casualties both survived. Another trip to Price Towers, somewhat delayed by council accounts so we only had time for one game. 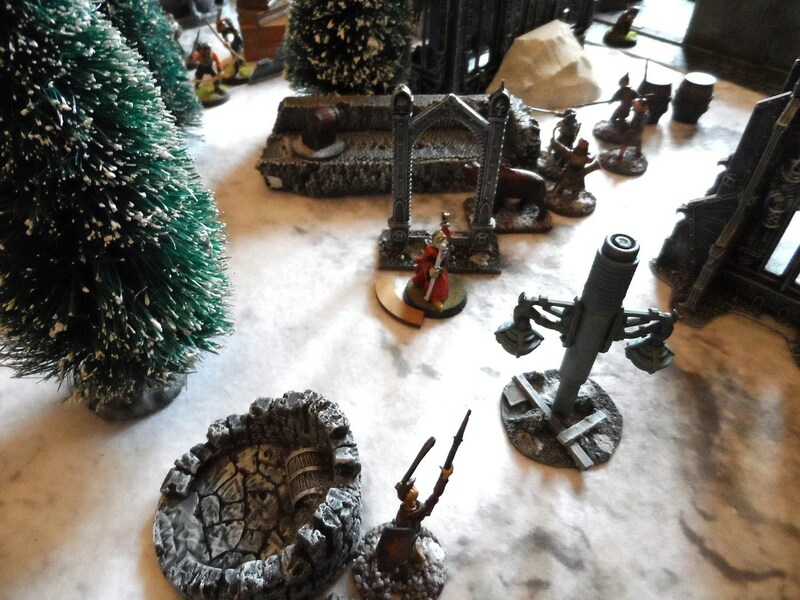 The net scenario in the Thaw of the Liche Lord campaign. 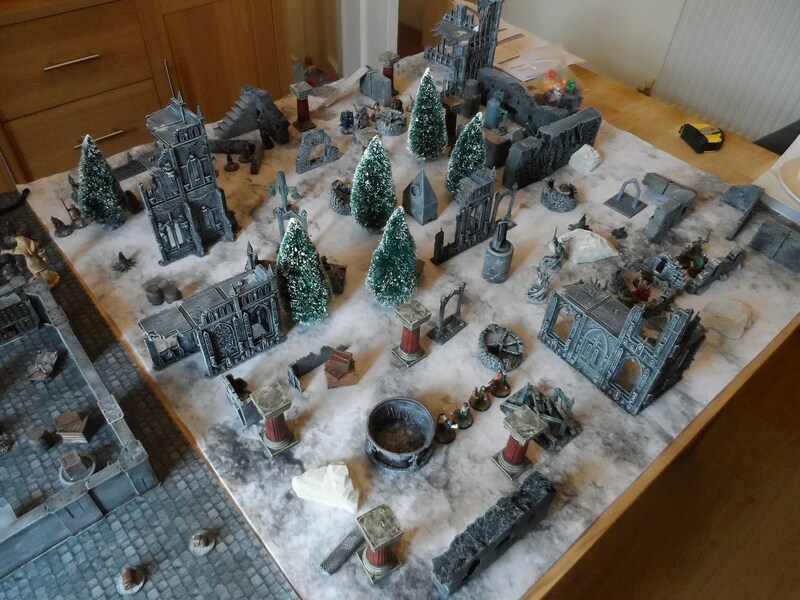 The main board set up, where most of the action takes place. 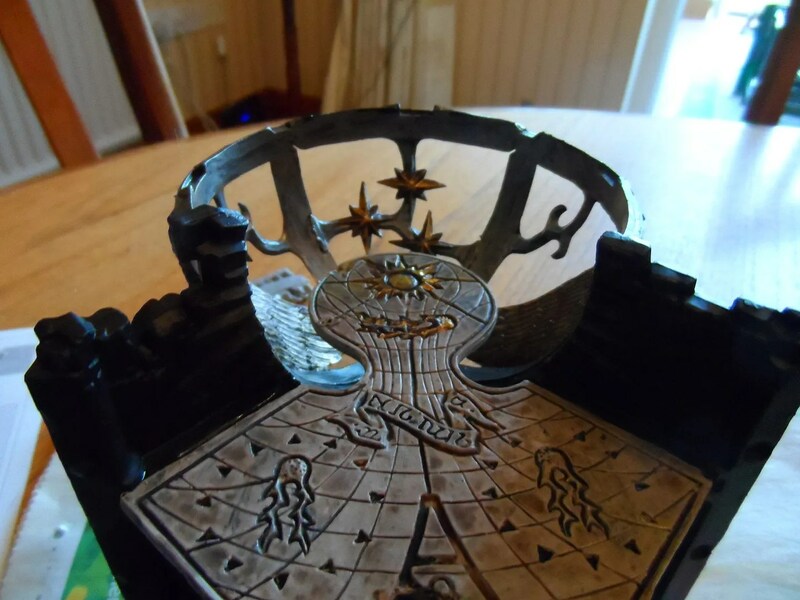 6 gates are scattered across the board, and they potentially lead to a secret room where more lucrative treasure is to be found. 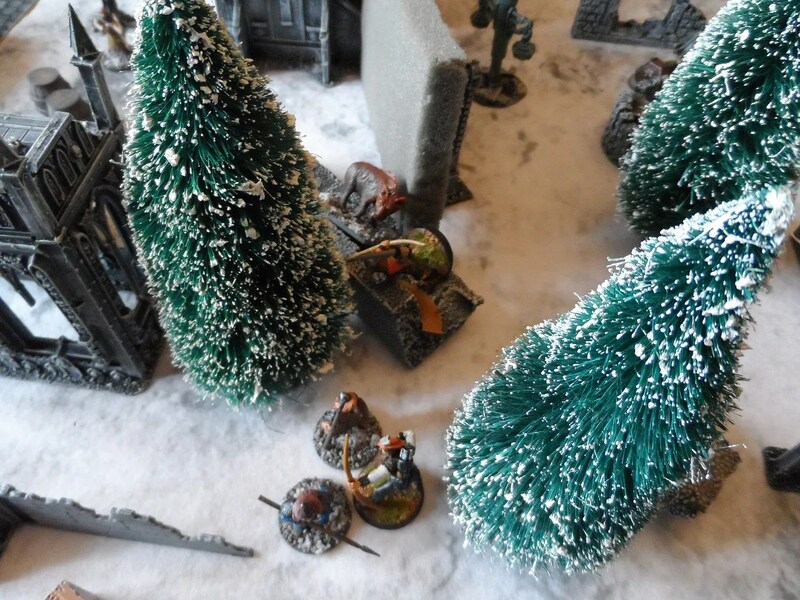 Pity its guarded by Frost Wraiths ! Thaddeus’ (who is EVIL and must be destroyed) set up. No sign of a Captain – Jon’s not had much luck with that character as yet. 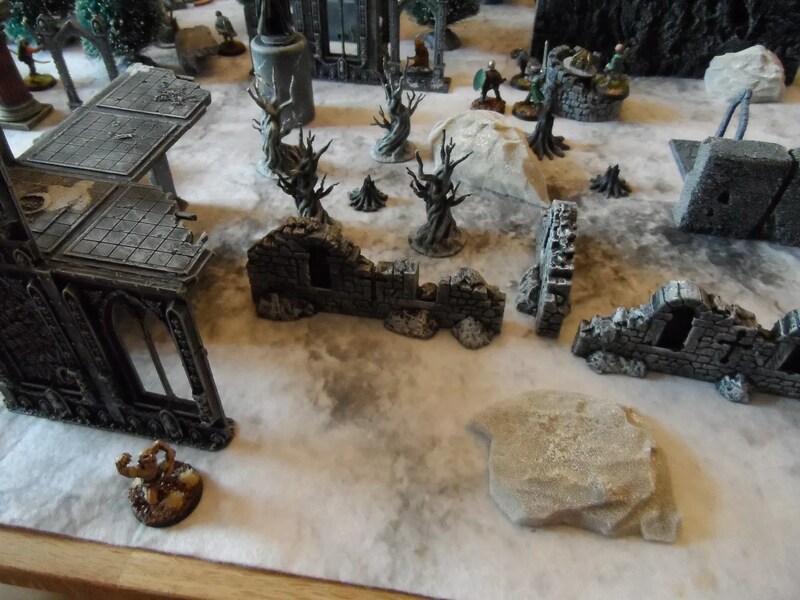 My war band picked up some treasure, and promptly a Ghoul arrived, right behind my lines. 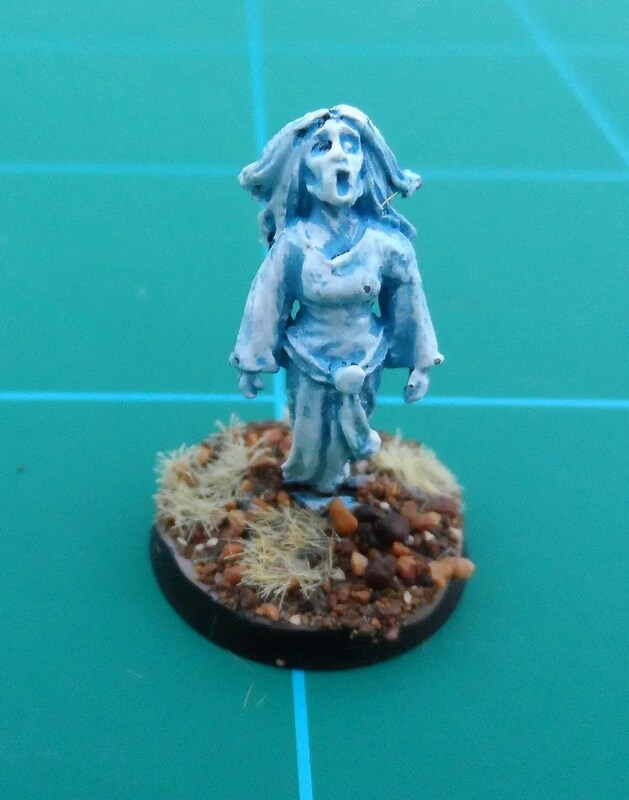 So we used one of the two ghouls I’ve just painted. 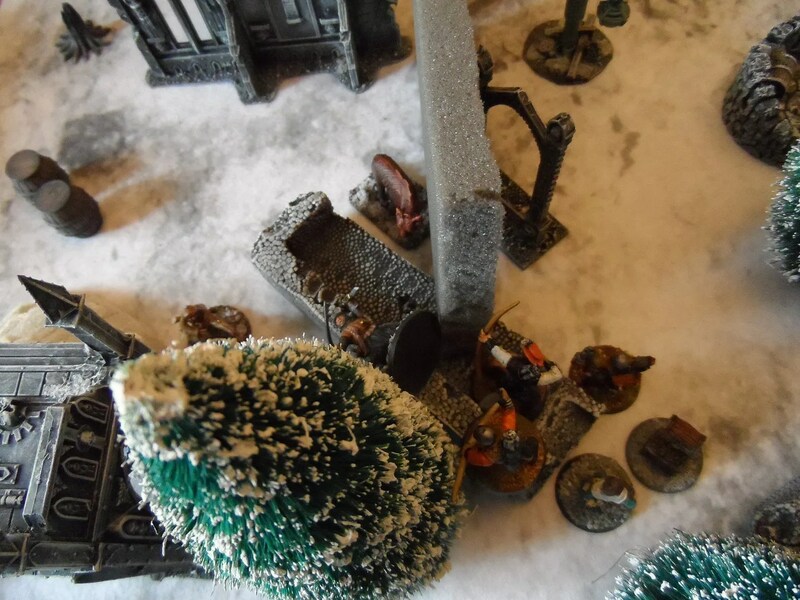 As Jon commented, I could now legitimately say: “I flopped my ghoulie on to the table“. 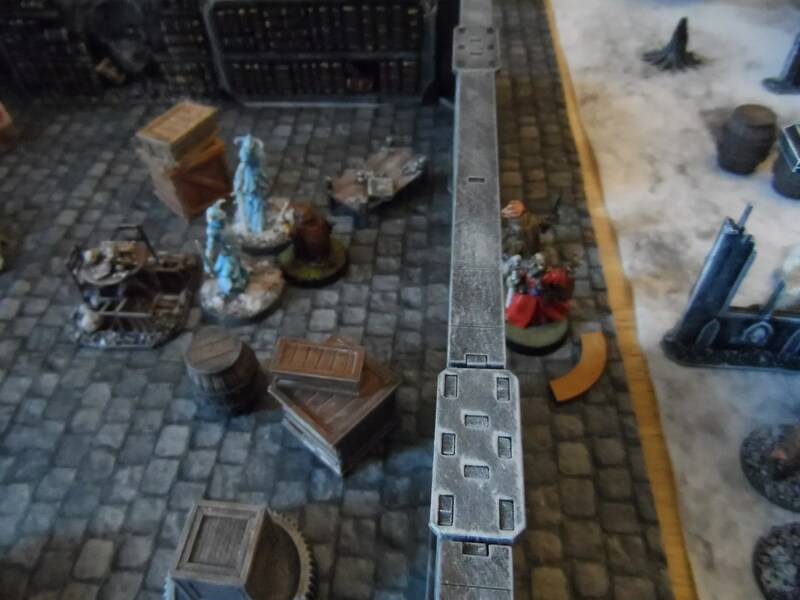 When not being bone darted (despite a Drain Word) Holbron also fluffed up a spell taking damage, but ever eager to keep the ball rolling, stepped through one of the gates to see if he could get to the secret room. 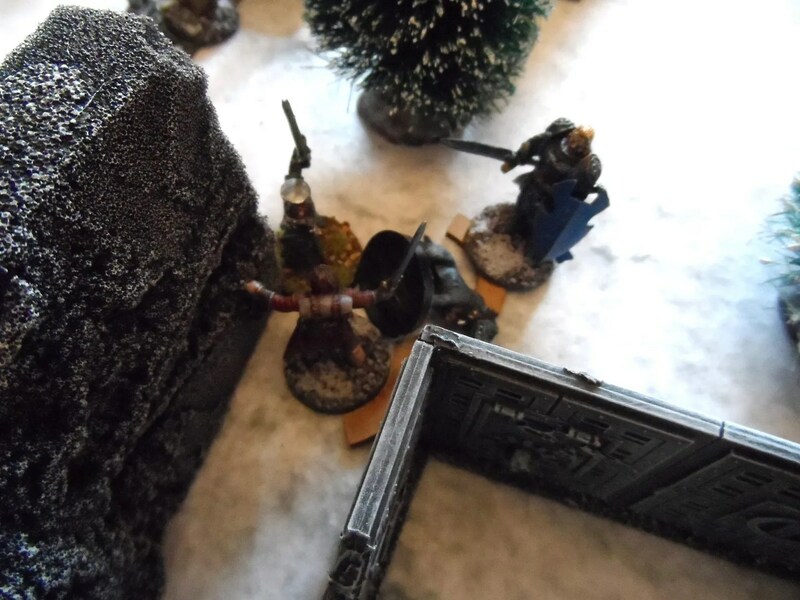 Previously, he’d sent an archer armed with an awesome magic dagger through, and who had promptly turned up at said secret room. Only things went a little wrong. 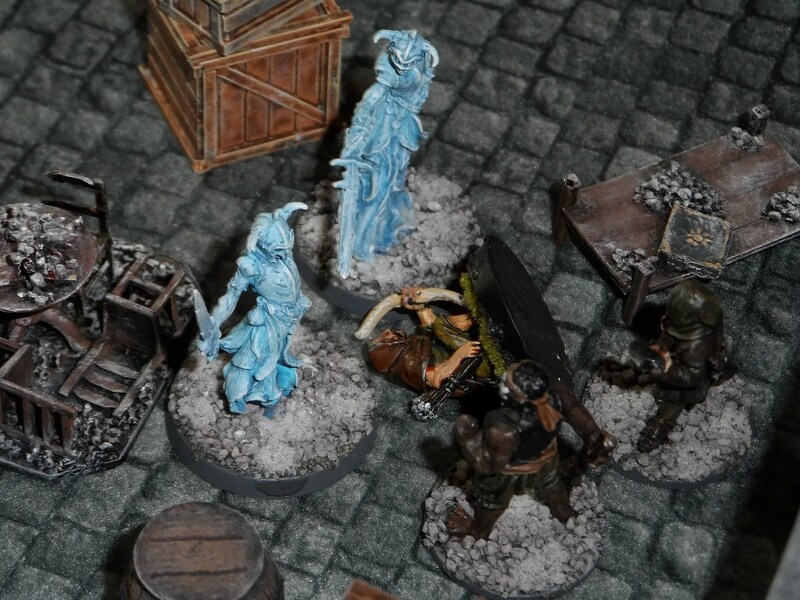 Instead of arriving at the secret room, Holbron promptly turned up right between a bunch of Thaddeus’ minions and Thaddeus (who is EVIL and must be destroyed) himself, far from friendly faces. 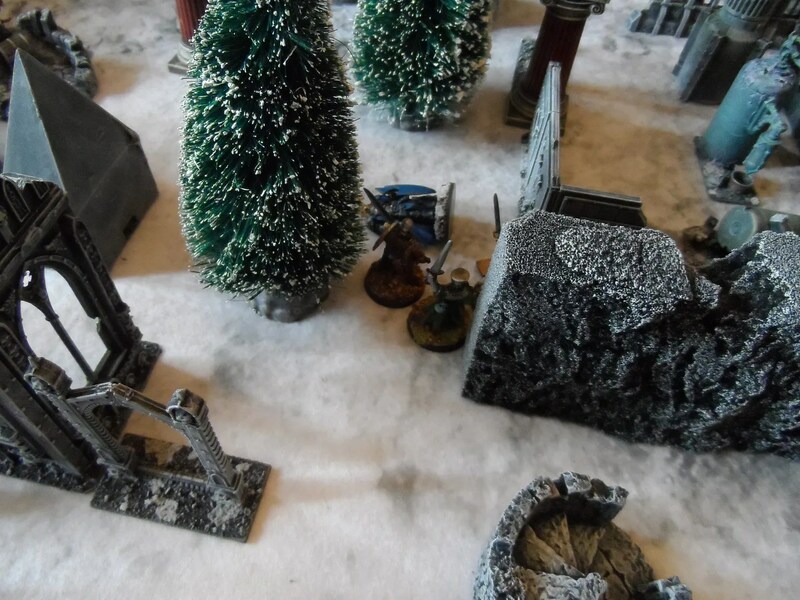 On the other side of the board, my Knight and war hound pounced on an enemy treasure hunter, only for the wounded dog to do the most damage, before in turn being jumped by the Blue Knight from behind. With predictable results. Things were not looking good. 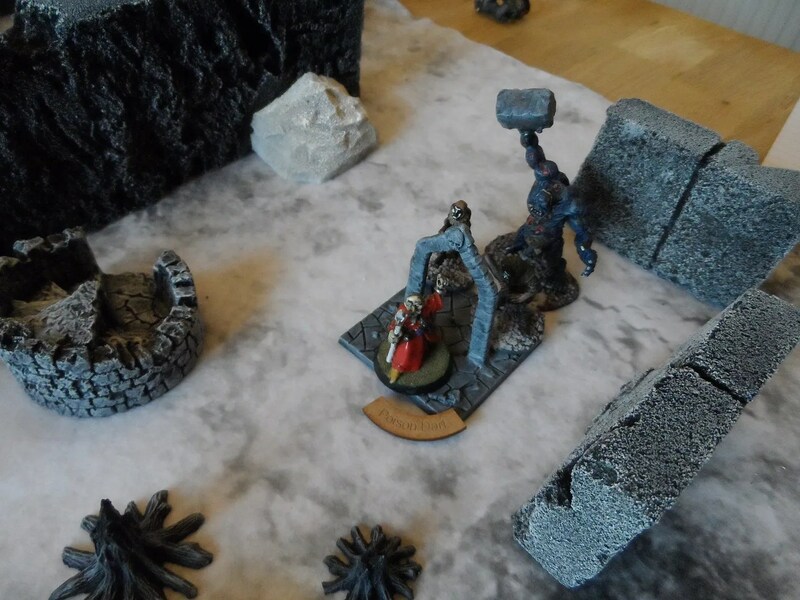 Gideon the Apprentice hustled up with some Rangers and a Treasure Hunter to, get the extra treasure chest from under the noses of the EVIL one’s minions, and also to plonk a Wall between them and Holbron. 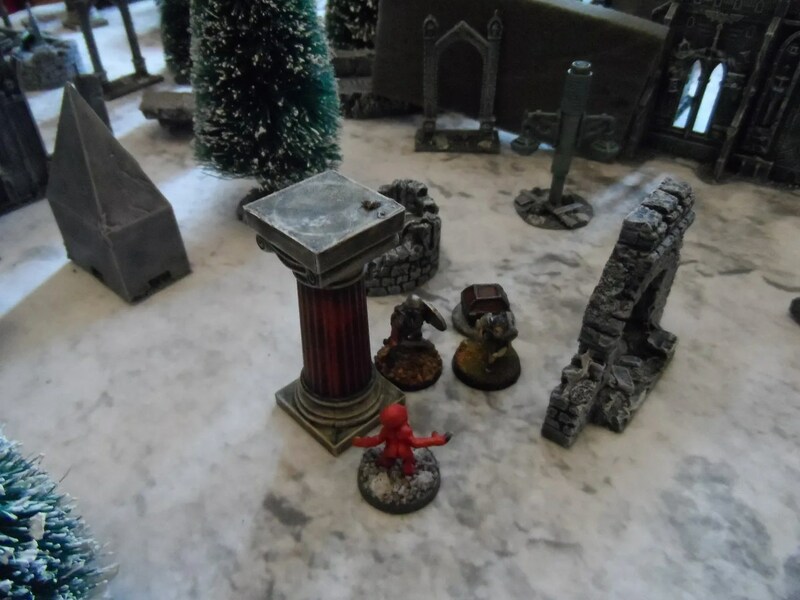 This just left Holbron face to face with Thaddeus – the skeleton the EVIL one had summoned was creaking away with some treasure. 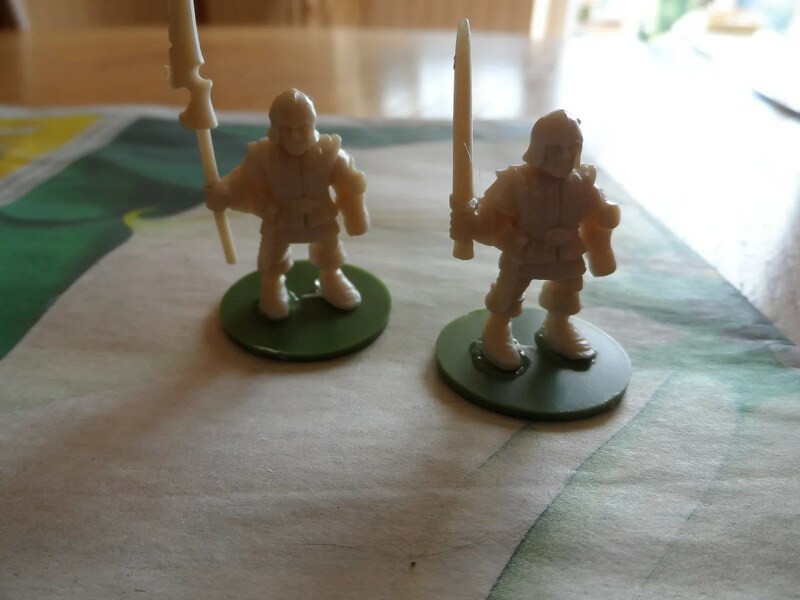 A Citadel C18 Night Horrors model I’ve had for years, and a a more recent Copplestone Castings one. I think this may have been a Banshee, but I think is better suited as a Ghost. OPianted with the same palette as I used for the stairway. 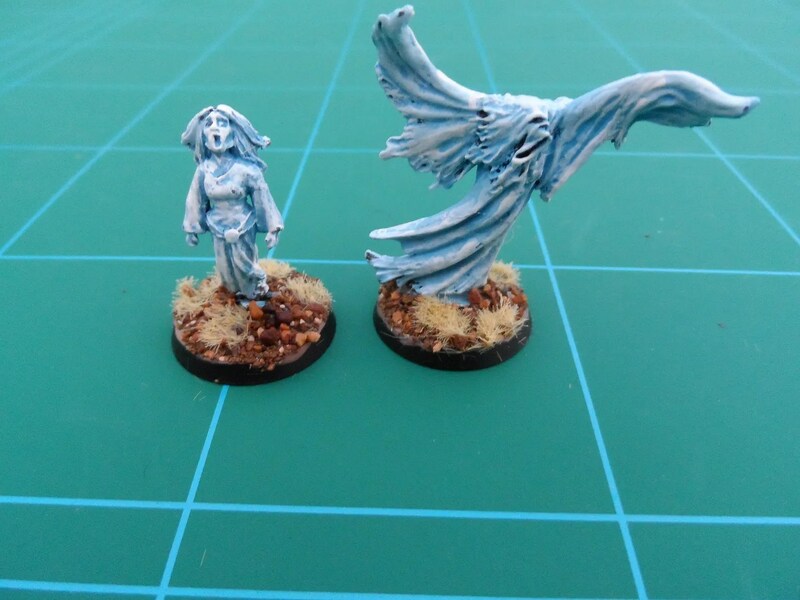 I’ve got a fair number of Ghouls already painted up, but here are two more. 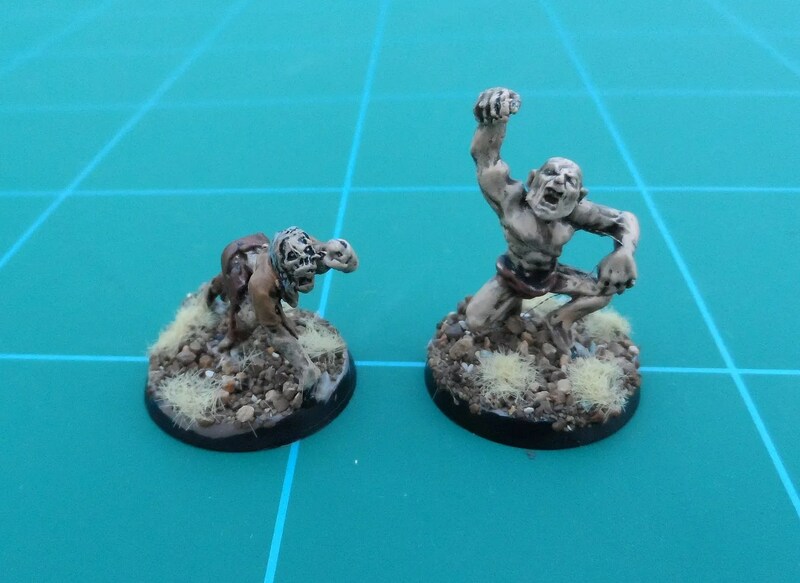 I had these for a couple of years, and seeing as Jp wanted a couple of Ghouls for the game this friday thought I’d paint them up. The right hand one is actually an old Citadel AD&D Ghast. 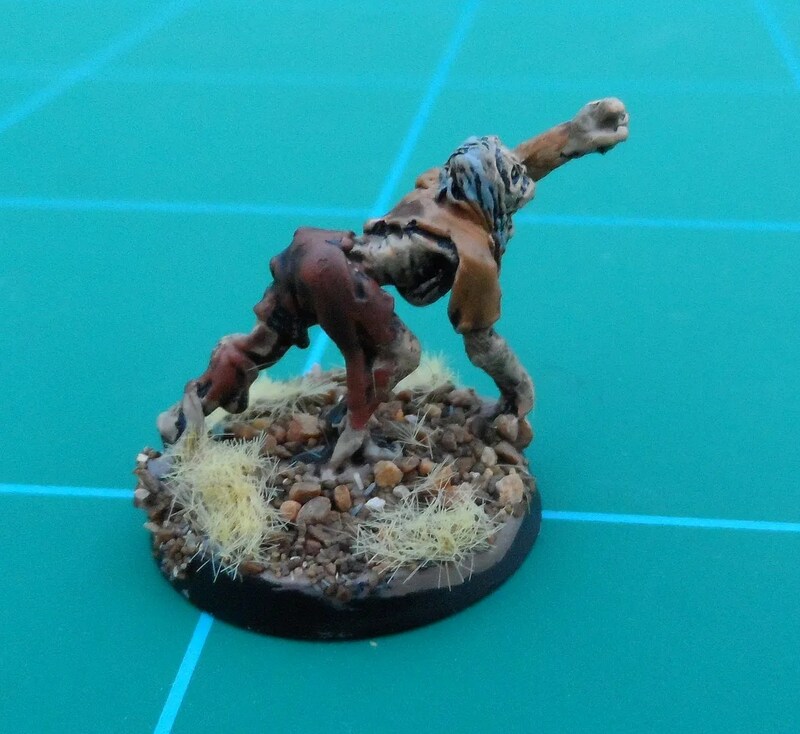 This chap, is a Fantasy Tribes Undead type, later in the Citadel undead range. Painted using a mix of Foundry Grantie and Flesh to give them a sickly hue. 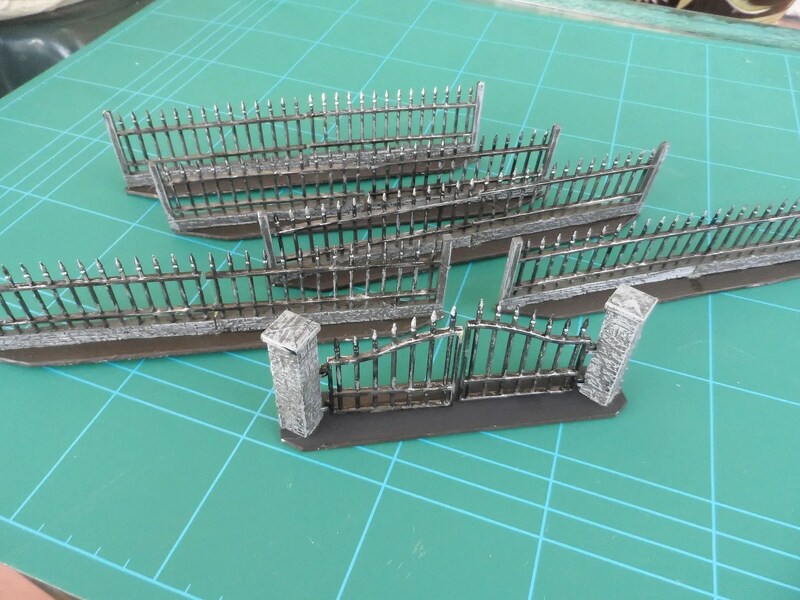 Renedra managed to sneak something out that i was interested in – Railings. 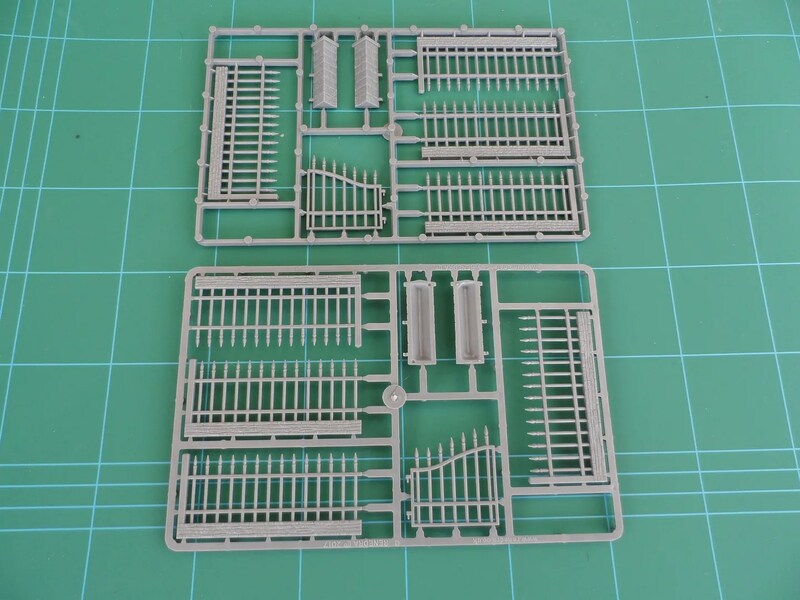 Here’s the contents of ono packet of railings, enough to make six doubles length pieces of railing (17cm). JP had got some MDF railings and they were good for making a long linear obstacle that could be seen through but not moved through (easily). 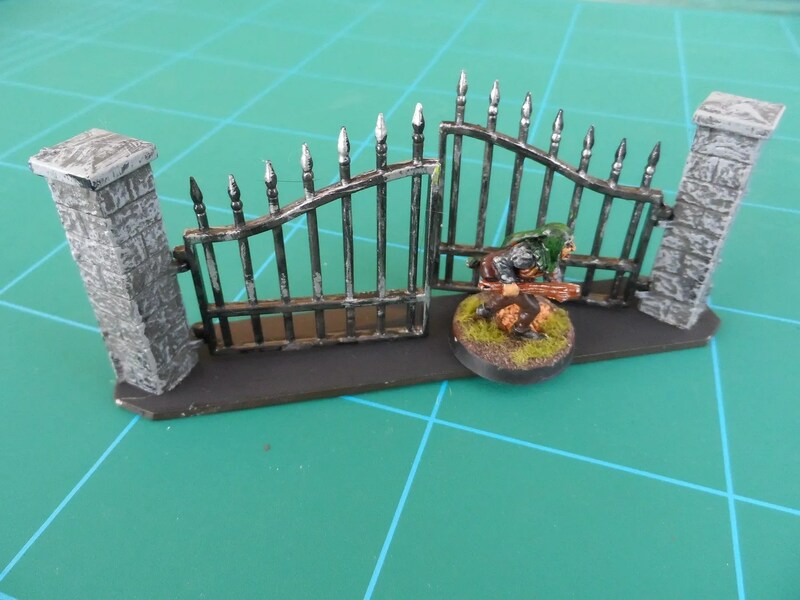 Helpfully, they have also done some big Gates to add in to the mix. 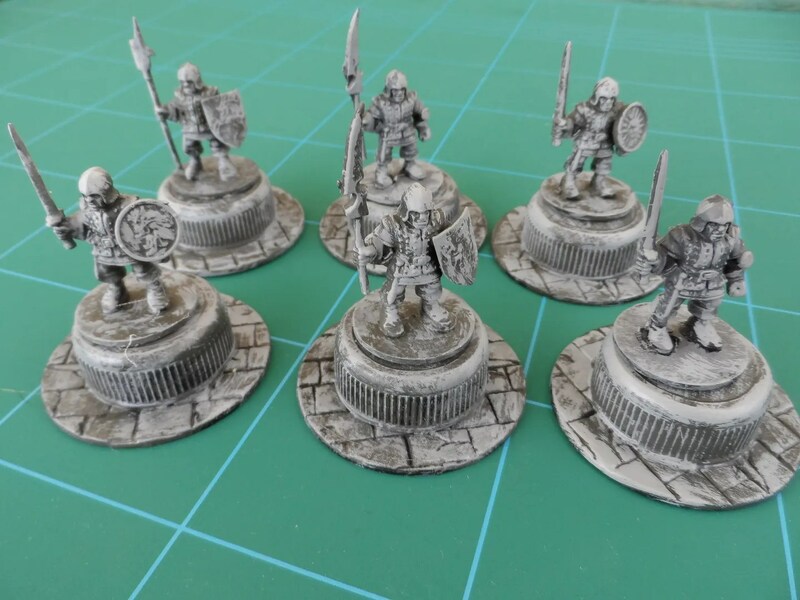 I did a quick and dirty job of painting them up – my basic stone grey highlighted with Foundry Light Slate Grey, and a similar dry brush job of GW dark steels. The gates are good, and I’ve left mine freely shining in the wind. 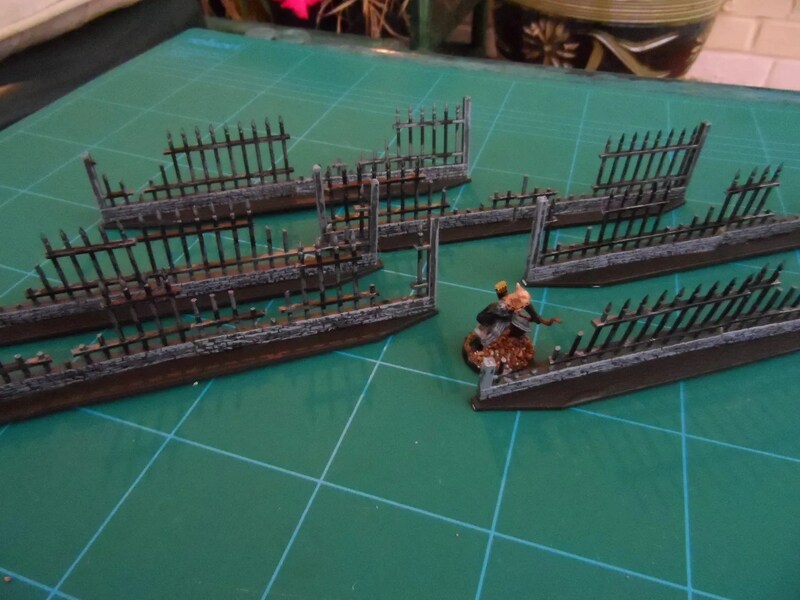 I bought two lots of everything, and so I’ll be taking the clippers to another set to make some smashed up railings to break up the pristine lengths of walling. I think these will be really good to break up and disrupt movement across the board, without breaking up line of site. I had considered brass railings, and maybe I’ll do that for the future. These kits are ideal for pretty much all of the periods/genres I play so are well worth the money. 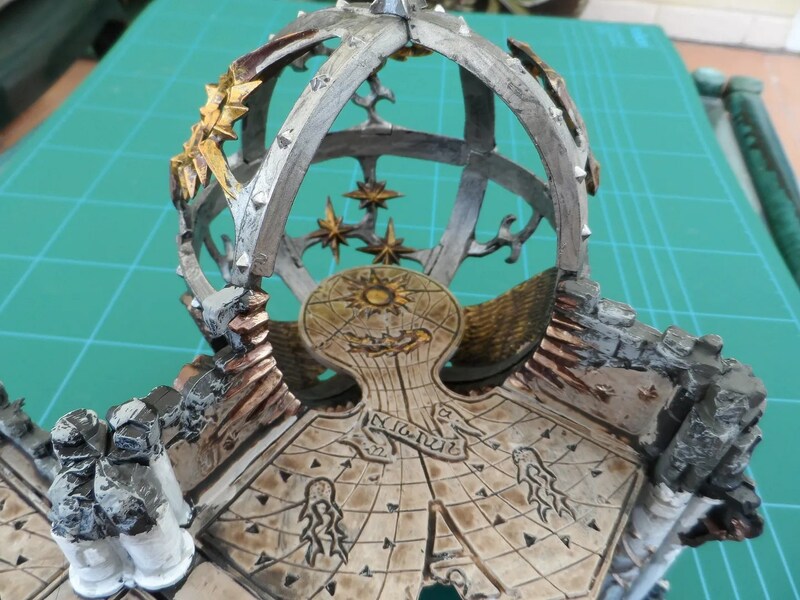 One of GW’s recent releases. 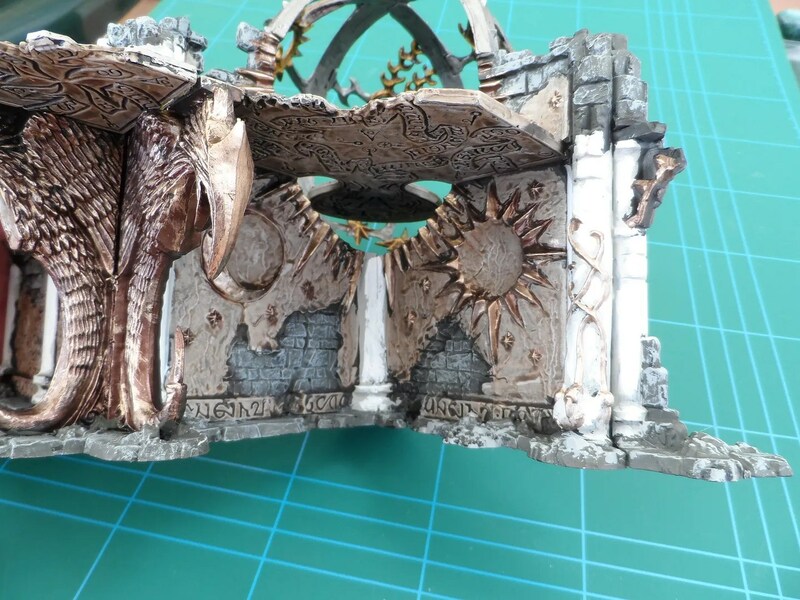 Again made out of very chunky plastic, and a few pieces make a very complex piece of scenery and isn’t for novices. 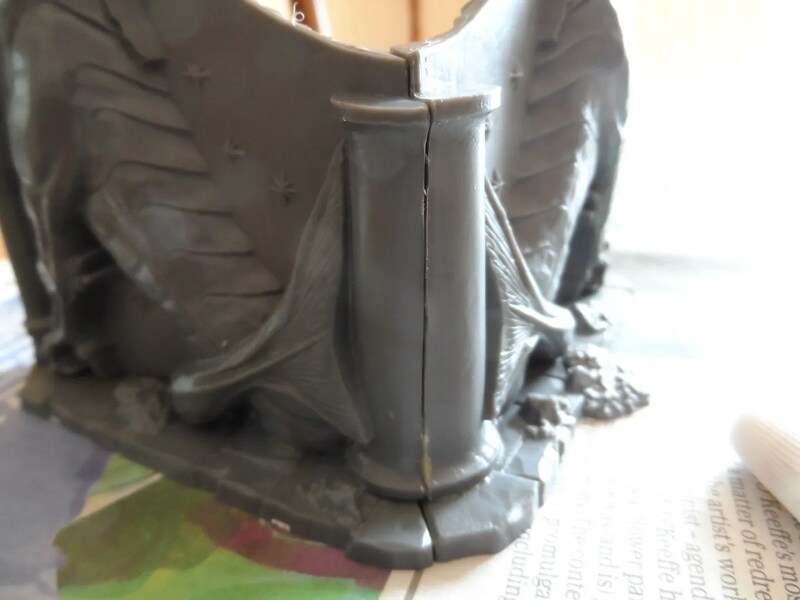 Lots of greenstuff was used to fill the many gaps – again the mould is not good and the pieces are warped and not true. 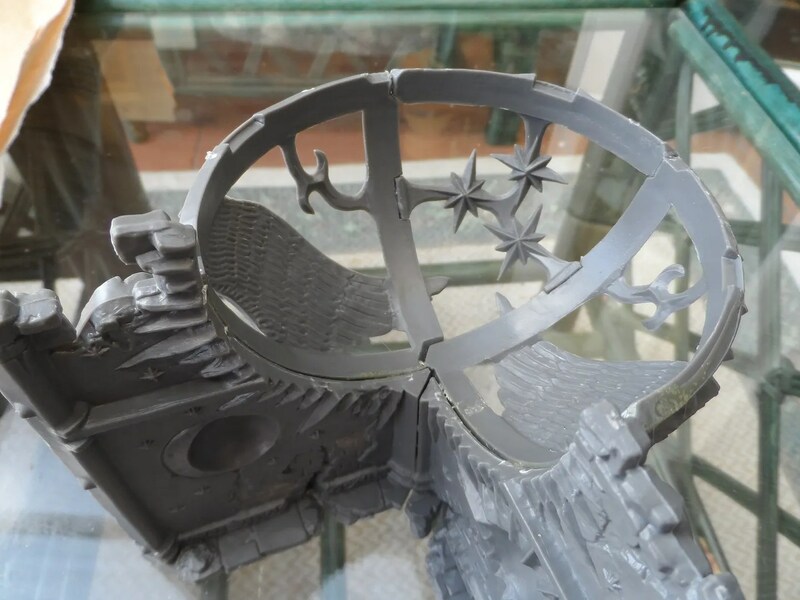 The pieces of the “cockpit” fit together well, once you’ve worked out how the jigsaw goes together. Having built Airfix aeroplane kits, I did remember to paint the inside of the cockpit before putting the top on, and the walkway. 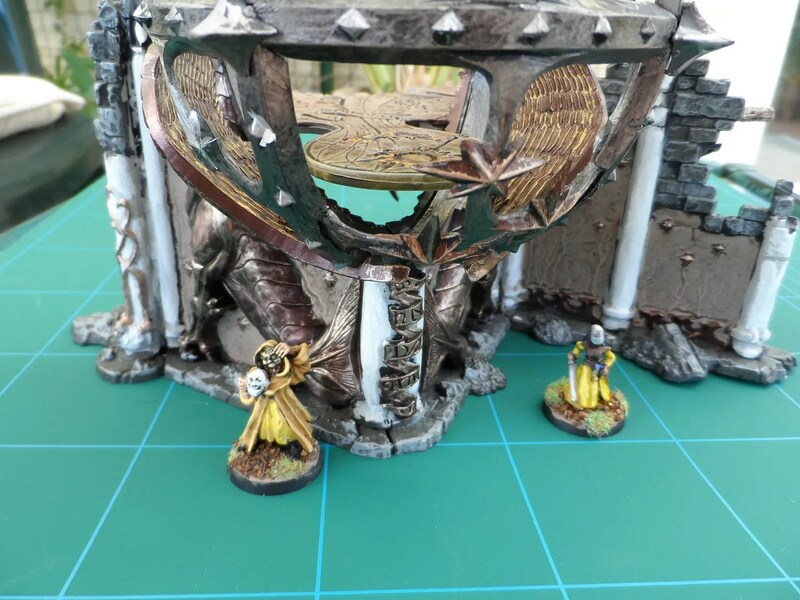 The walkway was painted with GW Khemri Stone, with highlighting in light bronze. The walls are covered in lots of detail. 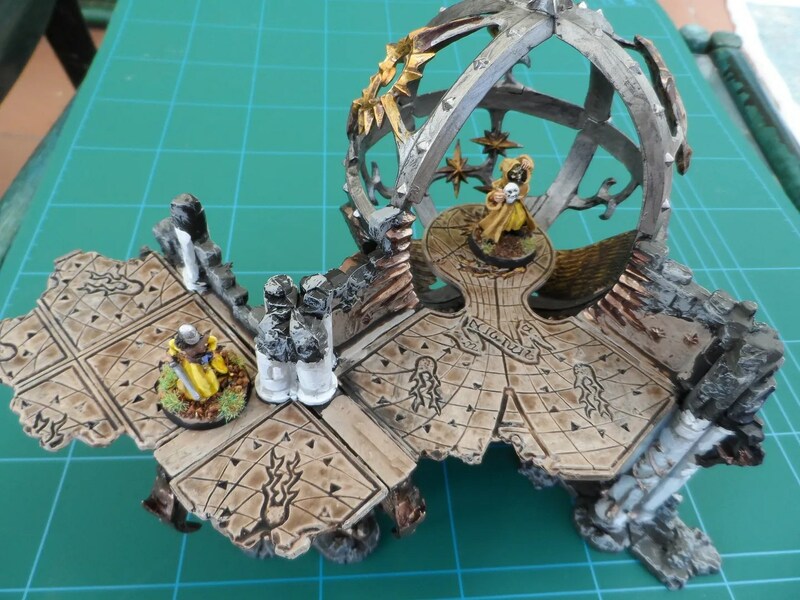 It was tempting to paint in lots of the details with more bronze and gold, but I felt I wanted to keep it slightly plainer, as my intention is to keep the focus on the figures. 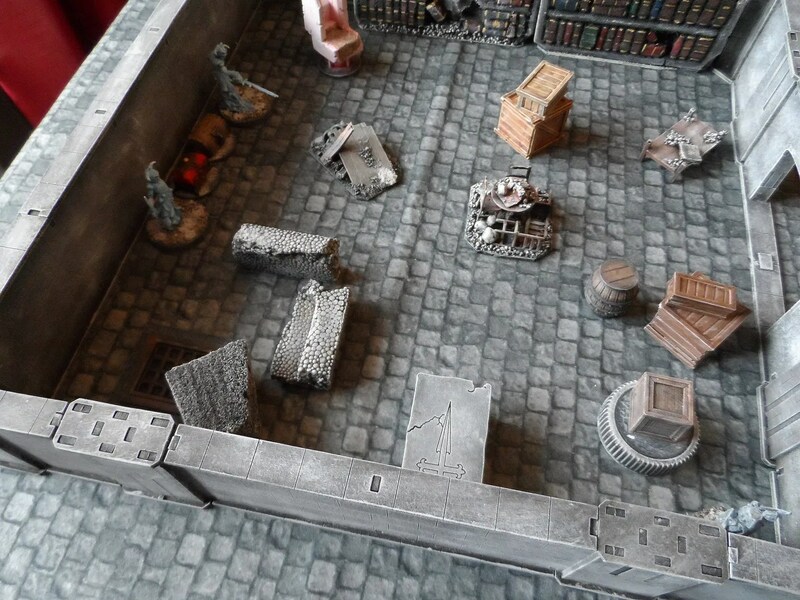 I kept the greys as per previous efforts – either Foundry Slate Grey or Arctic Grey. 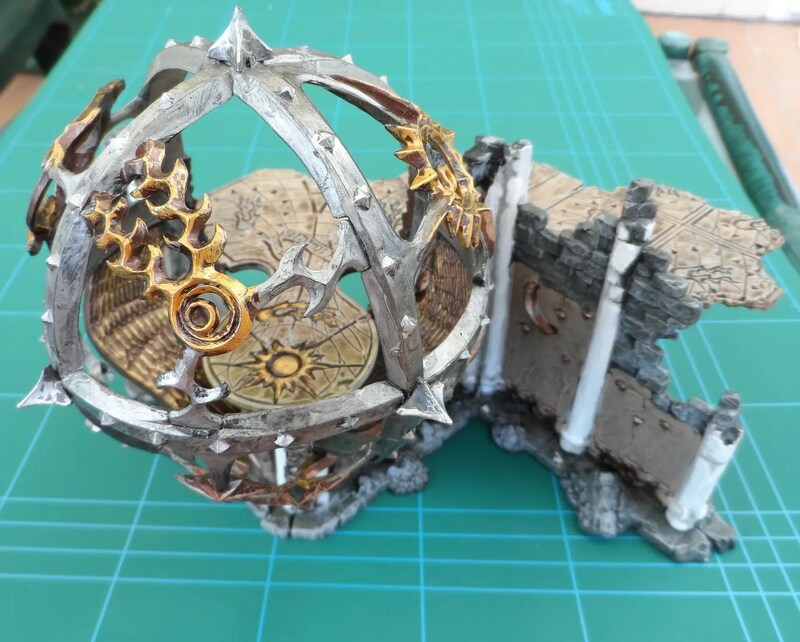 The first floor of this scenery pieces is nice and big, so you could easily put treasure up there and stage a scrap. The floor is about 3 inches up, so a bit higher up than my normal home build scenery. Overall, this is a really good piece of kit aside from the green stuffing required. 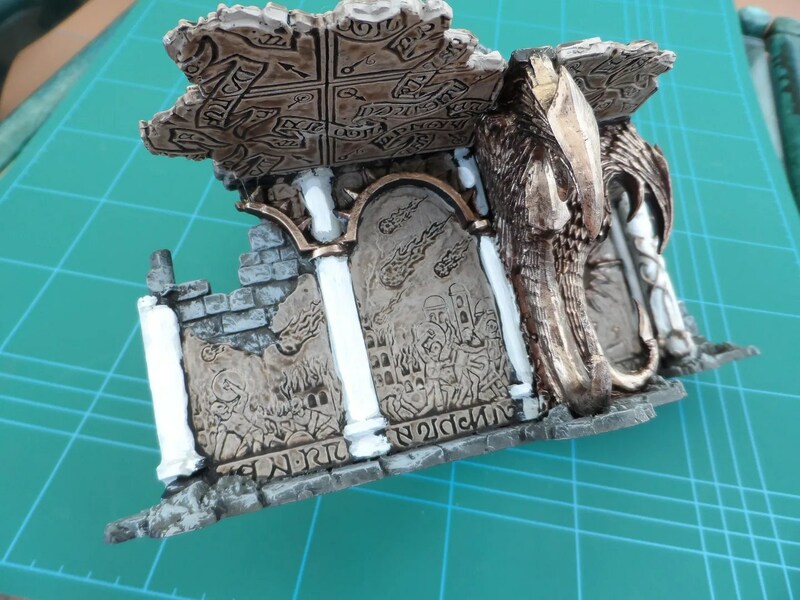 It should look really good on any table, and for the price its worth it.